When the St. John’s Child Development Center (CDC) Advisory Committee met to discuss goals for the year, the spiritual, mental, and physical health of the CDC remained at the top of the list. A new approach to outdoor play fit right in. In March, St. John’s entered into a collaborative partnership with the NC State School of Design and the Catawba College Center for the Environment. Together, they’ll design a naturalized outdoor learning environment that will be one-of-a-kind. That’s right. The plans are not for just for a new playground with new equipment; instead the team is working on a design that provides our children with a more naturalized outdoor learning environment that encourages creative play. The project will include outdoor classrooms, natural sensory play, and sand and water play, and more. 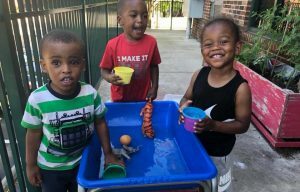 Children will have the opportunity to grow fruits and vegetables, discover animal habitats, and explore nature via timber decks, pathways, and shade trees. The benefits do not stop there. NLI notes improvements in creativity, problem-solving skills, academics, reduced attention deficit disorder symptoms, and reduced stress. As part of the project, Courtney Bost, CDC Director, has enrolled in NC State’s Early Childhood Outdoor Learning Environments Certificate Program. All St. John’s CDC families and staff members will begin sharing their ideas for effective design and development by completing a staff and parent survey. Contribute. A fundraising campaign has begun to complete the project. Work will not begin until funding is in place. A precise budget will not be known until a design is approved, hopefully by the beginning of summer. Indicate “CDC Playground” on your contribution.